Patio tables, delectable appetizers and a full bar menu, and a breathtaking panorama of Okinawa’s coast from Naha to Chatan. 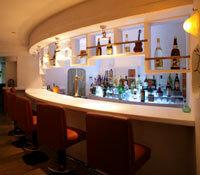 That and more awaits customers to Hanjya Sea, a bar that’s “not just a bar” in Chatan’s Minato area. It’s a special place for those special, intimate times with family, friends and acquaintances. The atmosphere is romantic, and boyfriend/girlfriend visits are often memorable. The Hanjya Sea drinks menu includes beer for ¥390 and glasses of awamori at ¥500 each, but also includes cocktails and soft drinks. Thursday is ‘Cocktail Day’ when all cocktails are half price at only ¥300. Wednesdays are ‘Ladies Days’, with groups of ladies offered libations at half price. The menu is diverse, running from salads and snacks, to Nasi Goreng for ¥750, all the way to a full seven-course dinner. The special dinner is ¥3,000, and includes drink refills and desserts over a maximum three-hour period. Dining is available both indoors and on the patio, and Hanjya Sea has a private room for more secluded gatherings. Hanjya Sea uses Ryukyu glasses, which are made by an affiliated company. Glasswares used in the bar are available for purchase. 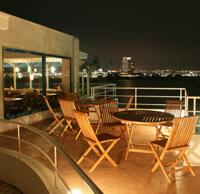 Hanjya Sea has its own parking area, and is open 6pm~2am daily, except Mondays. Reservations are possible by calling (098) 926-3580. Participation in the Japan Update Weekly Raffle could find readers a winner; Hanjya Sea will be offering ¥2,500 in coupons for two people next week.